In order to understand why our composing models are so light and strong and what is the difference between our construction and technology differs from the traditional let&apos;s consider the forces that influence the wing in a flight and which parts of the construction take them up. During the flight the wing of a model is influenced by aerodynamic forces that curve and twist it. 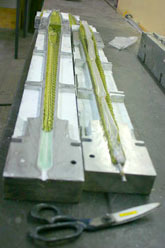 In the construction of a built up wing curving forces are taken up by the spar and the twisting ones by the D-box construction. D-box is a tube in a letter D form in front of the spar. The back parts of the rib pass the load from the flaps and the wing skin to the D-box and the spar, that&apos;s why they must also be hard and strong enough. Now very few is left to be done. It&apos;s just to make all the elements of the construction extra light and extra strong to achieve the needful for an ambitious flight stability. 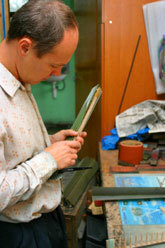 We use special technology for strengthening the spars in the models. 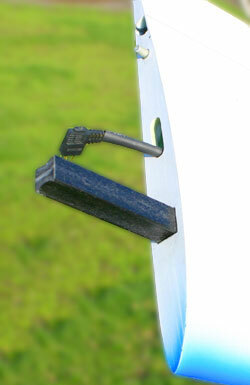 To achieve the most strength we prepare the plates of carbon with special epoxy for spars. Carbon fiber is a micro pipe. That&apos;s why it is necessary to use special solvents for epoxy to saturate carbon fiber better. 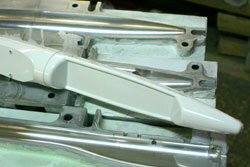 We use the so called prepeg gluing technology, which is widely used in the aircraft industry. 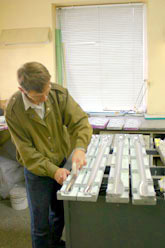 Carbon is first imbued with epoxy which doesn&apos;t polymerize at the room temperature, then the needful quantity of layers and the plate are put into the form. When this form is put into the stove there appears an excess pressure of about 30Bar and at the temperature 1500C the epoxy polymerizes. and create pressure of 30-50 Bar. 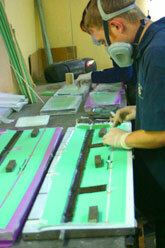 Thus received plates we glue to the balsa cut in vertical direction with epoxy in vacuum. Then we cut this plate according to the needful sizes of the spare width and mould a place for the joiner in the matrix, wrapping it up with carbon rowing. 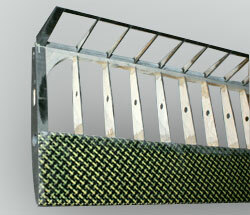 In order to increase reliability the ready-made spar wound around with the kevlar thread. In this way we achieve high strength and inflexibility by the minimal weight of the spar. The D-box coating, which is to take up the twisting forces, we make of Kevlar-carbon fiber which we place at angle of 45. 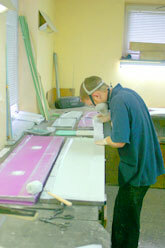 This covering is produced according to the same prepeg technology as a very thin film. D-box and landing edges for Graphite and Simply the best we make using the same technology. 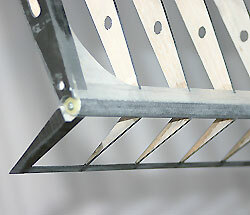 The outer panels are connected to the inner panel with a removable CF wing joiner. 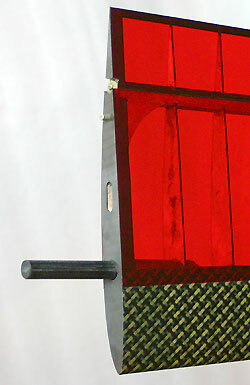 The wing is covered by the transparent Oracover. The accuracy of fit is perfect here as it is throughout in the Graphite. 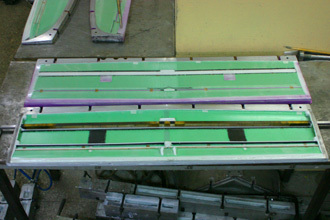 An original construction was applied for the flaps and ailerons. Spar of flaps and ailerons is a carbon pipe. We produce this pipe of carbon cord with the 45 grades direction thread. 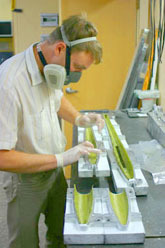 When we glue ribs with carbon cap-strips to this pipe, we get extra rigid and strong flap or aileron. It&apos;s hard to believe but this flap or aileron is stronger and more rigid than a molded one. This pipe is also the axis of the flaps rotation. Thus we reduced weight and made the work of the flaps and ailerons most accurate. The flaps can rotate down 90 degrees, which makes the brakes very efficient. Due to very accurate, without any slots, installation of the ailerons and flaps we achieved excellent airflow of the wings. The model flies at high speed very quietly without usual whistle. Our experience of this way constructed models operation since 1997 has shown that our efforts for creation of these complex constructions are completely justified. We&apos;re often asked many questions about our models technology. Let&apos;s open the curtains of our main secrets. I&apos;ll try to show you the technology thanks to which our fuselages are on one hand stronger and on the other lighter than those you can usually see. The difference is that we glue the fuselages in aluminum CNC forms, which allows us to use pressure and higher temperature when polymerizing the epoxy. During this the layers of fabric are pressed together and the excess of epoxy is squeezed out then the epoxy is strengthened. 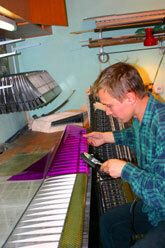 - Our special separator is put onto the form (pic. 1). - The form is painted with acrylic paint (pic. 2). - Needful layers of fabric are put into the form: they are cut on one side and left with an allowance of about 10-15 mm on the other (pic. 3). - A sac is packed into the side with an allowance (pic. 4). 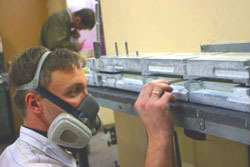 - The form is closed and the allowance is touched inside in order to glue the sides of the fuselage (pic. 5). - 3 Atm pressure is supplied to the sac and the form is put into the stove with the temperature 600C (pic. 6). 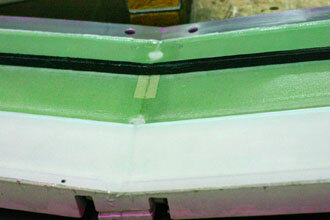 During the last two years we&apos;ve run lots of experiments on the wings and stabilizer gluing technology. We&apos;ve set an impossible task to strengthen and to lighten the construction at one and the same time and we managed to fulfill it but we do not stop on the achieved results and go on searching new approaches to technology and construction. You can read about the materials we use for our machines on the pages of each model. - Our special separator is put onto the form (pic. 7). 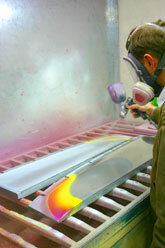 - The form is painted with acrylic paint (pic. 8). - Needful layers of fabric and reinforcement (brackets, extra pieces of fabric for local strengthening) are put into a form. The layer that we put inside of the sandwich is separately soaked on a polyethylene (pic. 9, 10). - We lay a preliminary prepared sheet of HEREX with the already prepared slots for the spar, flaps and all other parts(pic. 11). 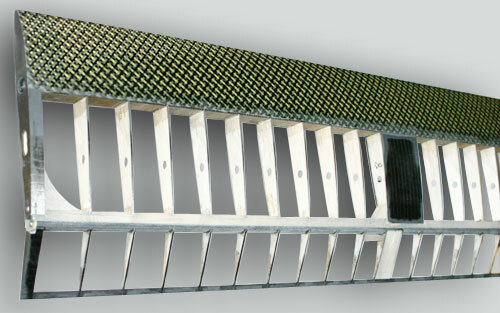 - We strengthen the spar slot with carbon fabric and put the inner layer with a film (pic. 12, 13). 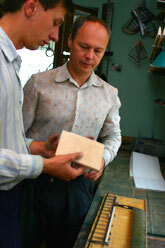 - We put the forms into the sac and pump out the air (pic. 14). - After the epoxy polymerization we cut off the excess of epoxy and glue needful balsa plywood beans covered by carbon to it (pic. 15). It&apos;s impossible to tell in short about all the details of our technology but I do hope that this excursion will help you to understand the world of models making better and to love this sport even more!